t's a joy to read a fine, well-argued piece of equity research that's written like an interesting story--and this book has not one but seven such stories. 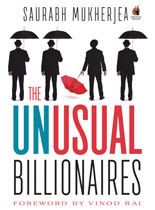 The Unusual Billionaires, written by a long-time Value Research contributor Saurabh Mukherjea, is a most unusual book. It has in depth stories about the rise and amazing success of seven Indian companies. These companies have created extraordinary wealth for shareholders over the last few decades, and have done so against tremendous odds. Mukherjea's book is unusual because it's extraordinarily well-researched. It goes far beyond the numbers and delves into the softer factors that really determine whether a business will see success that will completely transform it. He tells the real story for each company, and most importantly, shows us how to evaluate businesses. If you have any interest in equity investments, or even just in businesses in general, then don't wait to buy this book. Value Research has arranged for it to be made available for our members at a special price of Rs 299, the lowest anywhere. That's a 200 rupees discount from the full price of Rs 499 and includes free express delivery by Blue Dart. Click here to buy the book at this special price.